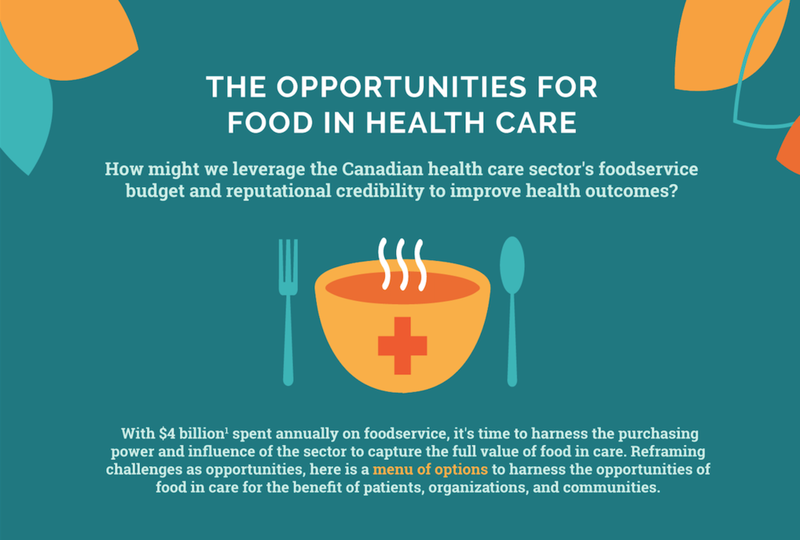 Nourish and its collaborators are launching a new infographic, The Opportunities for Food in Health Care, to illustrate how food choices can enhance the patient experience, support organizational results and efficiencies, and contribute to community wellbeing. There are a lot of reasons why food matters in health care. Nourish launched because we heard dozens of exciting reasons why healthcare organizations care about the impact their food choices are having. They varied from the personal to the pragmatic: a desire for loved ones to be nourished and feel cared for, an inclination to contribute to building stronger local food economies, or a frustrated drive to reduce the food waste coming back to the kitchens. Motivations linked to other issues also came up, like climate change, cultural safety, and malnutrition. Almost a year ago, our team started to map the ways food added value through health care organizations. While often framed as a cost, we saw myriad examples of where food is valued as a strategic investment in enhancing the patient experience, in supporting organizational results and efficiencies, and in contributing to community wellbeing. Looking at this from multiple perspectives allows us to see the interrelated ways in which food impacts health and well-being inside and outside the hospital walls. This infographic is a menu of options for addressing complex challenges in healthcare with food-related opportunities. The menu items on offer provide sixteen different ways to think about why food matters to health care organizations. Don’t try to eat it (or do it) all at once! We suggest you dive into the opportunity/challenge pairs that resonate with the priorities you are currently stewarding. This infographic weaves together the ideas and innovations of people working at different locations in health systems across Canada, including our Nourish innovators and partners. Some projects are low-cost interventions that we hope inspire you to take a first step, while others are deeper systemic interventions for institutions ready to take a pivotal role in shifting the food and health systems to a culture where food is a part of healing and public well-being. This project is a collaboration with powerful allies who are also thinking about the impact of food in health care: the Canadian Association of Physicians for the Environment, the Canadian Coalition for Green Health Care, the Canadian Malnutrition Task Force, Dietitians of Canada, Food Secure Canada, HealthCareCAN, MaRS Solutions Lab, and the University Health Network’s OpenLab. Each of our collaborators helps Nourish to hold the big picture about all the many ways we can think and innovate around food in health care. The process of collaborating has pushed us to understand our own work in new ways, and we are grateful to do this work in good company. We invite you to dive into the menu and share your ideas about what struck you and what you’re already working on. You can join the conversation online using the hashtag #FoodisHealth.